The European members of this genus are recognized by their overall appearance, hymenophore of gills, and the presence of fugacious arachnoid (like spiders net) veil. 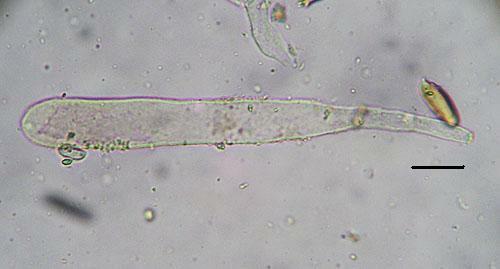 Fruitbodies with fugacious arachnoid veil, its remnants seen in the upper part of the stipe. 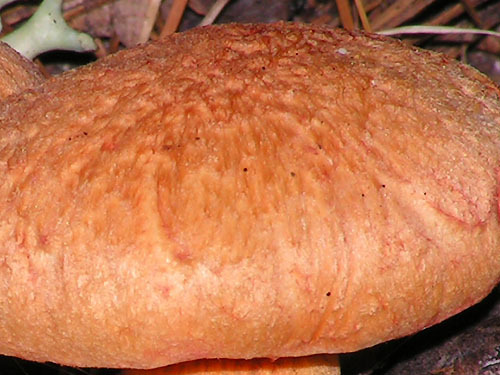 Cap up to 7 cm, at first hemispherical then expanding to convex or to flat-convex in very old fruitbodies, pale ochraceous with orange tint to orange, sometimes with carmine violet or pinkish violet tint, especially towards the cap margin, sometimes in very old fruibodies entirely vinaceous, dry, cottony, felty, sometimes cracked or scaly. 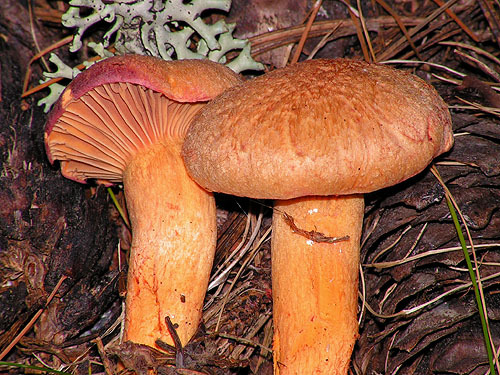 Stipe mostly cylindrical or sometimes spindle-shaped and usually tapering towards the base, pale ochraceous with orange tint to orange, sometimes with carmine violet or pinkish violet tint; mycelium at the stipe base pinkish. 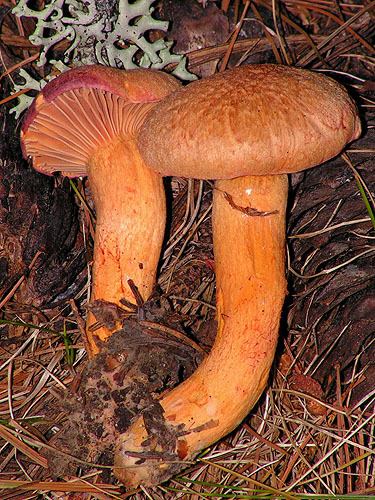 Flesh orange to orange-yellow, unchanging when exposed to air. 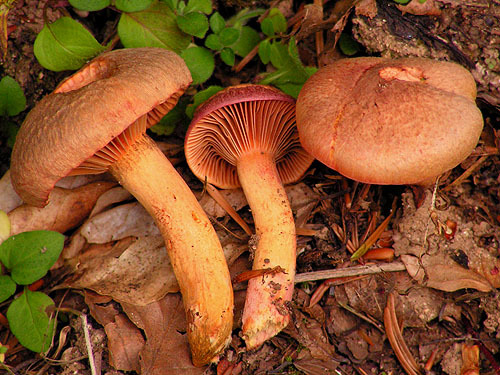 Gills orange when young, gradually becoming brownish with age. Smell not distinctive. Taste not distinctive. 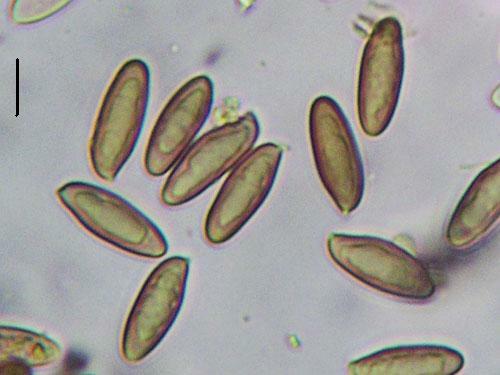 Spores 17–20 × 5–7 μm. Habitat. In coniferous and mixed forests, mycorrhizal with spruce (Picea). Distribution. Mountain species – Alps, Carpathians and the high mountains of the Balkan Peninsula. Similarity. 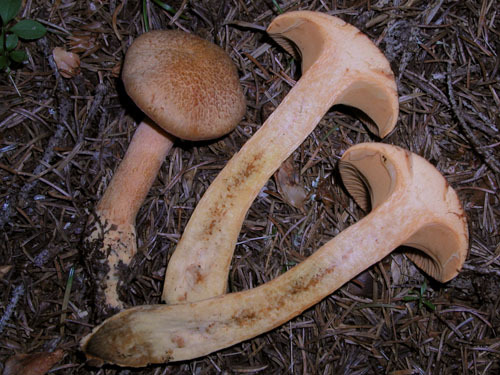 Similar and might be confused with Chroogomphus rutilus, but it has smooth and often slimy cap surface and differently coloured gills and flesh. Dörfelt, H. 1977. Zur Taxonomie, Verbreitung und Ökologie des Filzigen Schmierlings Chroogomphus helveticus (Sing.) Moser. – Feddes Repertorium 88(4): 273-285 + Tabs I-II. Bresinsky, A. 1965. Exsikkatenschlüssel für die Gattung Gomphidius in Mitteleuropa (Agaricales). – Mitteilungen der Botanischen Staatssammlung München 5: 125-134.